On September 17th 1917, at the height of the First World War, Constance Todd was ordained to the congregational ministry at the then King’s Weigh House now the Ukrainian Catholic Cathedral of the Holy Family in Exile, in London. She was ordained alongside her fiancé, Claud Coltman, and they were married the following day. Congregational Churches are member denominations of the Free Churches Group (CF and URC). Constance Coltman had studied Theology at Mansfield College Oxford. Many events and celebrations have been held during this year to commemorate Constance's ordination. Earlier in the summer, at Mansfield College, for a special day of events and fellowship, members of the Free Church Education Committee, including Revd Joy Langford BA, worshipped and shared with Baroness Kennedy of the Shaws: Helena Kennedy QC, FRSA and Revd Dr Janet Wootton MA (who has served on the Free Churches Council). (Pictured here - left to right - Baroness Kennedy, Revd Langford, Revd Wootton - photo by Revd Sara Iles). You can read more about Constance Coltman's compelling and radical ministry in service to God HERE and by listening to the Sunday Sequence and to this Radio 4 programme on Woman's Hour. 500 years since the Protestant Reformation - learn more here! It’s almost here! We look forward to seeing you at what promises to be an informative and enjoyable evening! All are welcome! 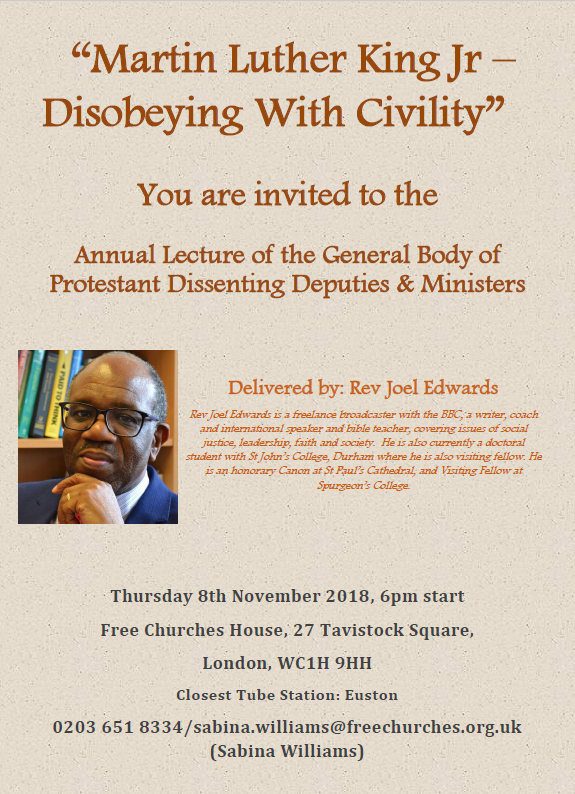 We hope that members of your congregation will join us at 6.00 pm at 27 Tavistock Square, London WC1H 9HH on Monday 6th November when the Rev. Dr John Bradbury, Minister of Emmanuel URC Cambridge and former Vice Principal of Westminster College will speak on “Luther’s Revolution – then and now”. The “Deputies” were established as elected lay people, working with a body of Ministers, in 1732 to fight for the removal of restrictions which excluded the churches and people we now call in the “Free Church” tradition from many areas of public life. London based, they argued on behalf of churches across the country. The Deputies have a long history of achievement. We maintain this somewhat quaint sounding body as an annual society to honour their memory and work. Free speech should never be taken for granted since it enables us to sustain our life, worship and witness. The body also keeps alive our historic right of direct approach to the Monarch. This is an open invitation to your members and Minister. It would be most helpful to know in advance of the numbers attending. Please return the attached form by post or email. Respecting our historical structure, it would be appropriate to nominate two “Deputies”, but all are welcome. Please display the poster. A small contribution to our meeting costs would be much appreciated from all churches. We know that it will be very much worth the journey to hear John Bradbury and we hope very much you will come. Churches Secretaries are requested to return the completed registration form as soon as possible, please. Luther's Revolution - Then and Now poster is available to download here. This invitation Letter is available to download here.